Expert scuba divers from around the world flock to places like Ambergris Caye in order to enjoy the incredible underwater landscapes and the warm temperature of the water. If you have never gone scuba diving before, but have always wanted to try, then Ambergris Caye is a great place to learn. Here are some helpful tips for beginners who are planning to try diving on Ambergris Caye. 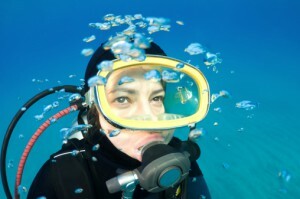 In order to try scuba diving, you will need a number of related items, like a regulator, a tube, an air tank and a mask. As a beginner, it is unlikely that you will have all of these items on hand with you in Belize. Thankfully, there are a number of places where you can rent diving equipment. Once you know what you, like you might even consider purchasing a few key pieces to use in the future. If scuba diving will be a focus of your vacation on Ambergris Caye, choosing accommodation close to the water will be helpful. Places like the Exotic Caye Beach Resort, for example, are just steps from the ocean and can provide you with a great spot to practice your new skills on the shore or catch a boat out to sea for deep-sea diving. In order to feel comfortable scuba diving, most beginners start with a lesson from a certified instructor. There are a number of these individuals on the island of Ambergris Caye, and you can easily find someone to provide private or group lessons until you get the hang of the sport. If you prefer, you can also participate in group dives to new locations, which might make you feel more secure as a beginner. While your very first diving lesson might be in a pool or perhaps right along the shoreline of the beach, you will quickly be able to venture to new destinations around Ambergris Caye. One of the most popular is the Hol Chan Marine Reserve, which is protected and full of colorful marine life swimming peacefully in the reef. Private boat charters can take you to a number of locations around the island, and there is even the possibility of night diving for the adventurous. If you are in Ambergris Caye for an extended period of time, you might want to get your own diving certification at the beginner or intermediate level. Look for PADI courses, or those run by the Professional Association of Diving Instructors, for certifications that easily travel with you to different destinations around the globe. Whether as a beginner or an expert, scuba diving on Ambergris Caye is incredible. Click here for more scuba diving tips.